This sentiment rang strongly at Young Invincibles’ Transforming College Search convening held on October 4th, at De Anza College in Cupertino, California. 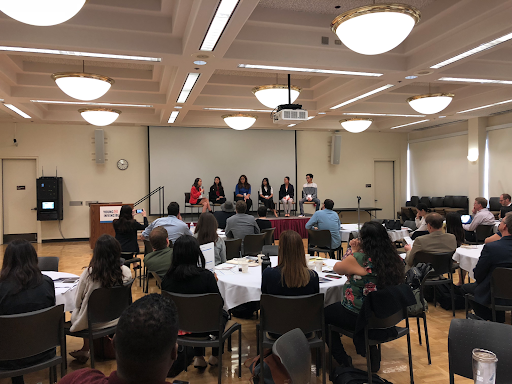 The event brought together over 90 leaders and experts in college search, including technologists, policy advocates, institutional administrators, school counselors, and students. 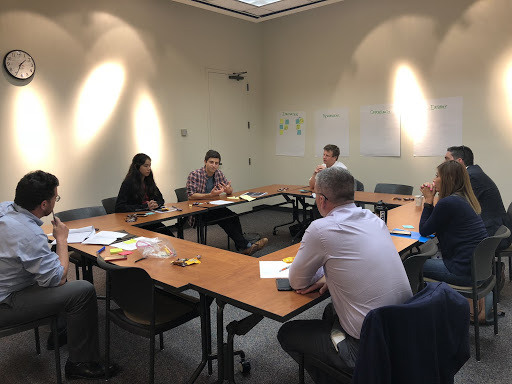 The goal of the convening was to spark discussion and bridge gaps between these stakeholders to better address student needs associated with college search tools. This convening was part of a larger YI initiative that aims to tailor college search information to be more helpful for today’s students, and empower them to make more informed decisions. 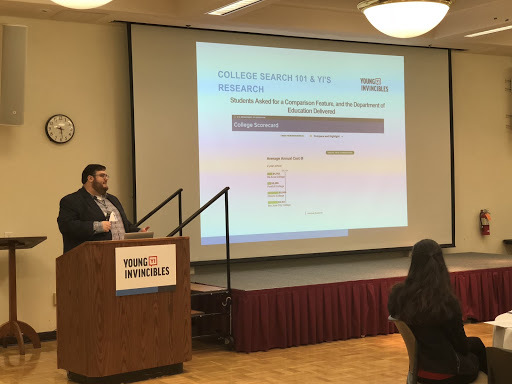 Greg Hirschfeld, YI’s Research and Partnerships Associate, presents original research on the current landscape of college search. Greg Hirschfeld, of Young Invincibles, presented original research that synthesized over 150 reports and peer-reviewed journals to discern how to build a better college search tool for today’s students.This research highlighted the need for tool designers to reach students where they are. Students care about program information, costs, and outcomes, and technologists must be able to develop tools that engage with students in these areas. 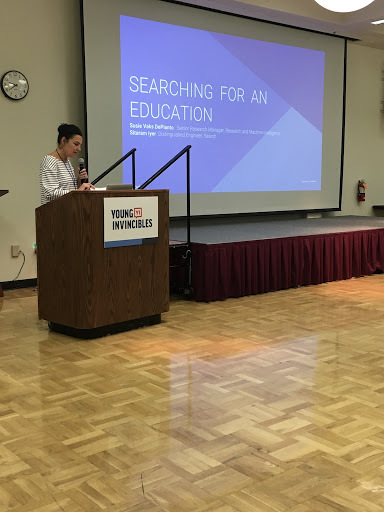 Young Invincibles research also emphasized the need for better data, particularly program-level data, that is better suited to the search behavior of today’s student population. Emily Getoff, Senior Outreach Coordinator for YI Advisors, moderates a student voices and perspectives panel. To prioritize the student perspective on college search, the event included a student voices and perspectives panel that featured five non-traditional college students, such as first-generation students working part-time.The students provided powerful insights into the college search process, and how they navigated the system with little outside help. This echoed Young Invincibles’ research that college search tool designers must be able to meet students where they are and guide them through the obstacles in the process. A policy panel featured leaders from Education Trust, the Western Interstate Commission for Higher Education, and the Institute for Higher Education Policy, that touched on some of the remaining challenges around college search with regards to the higher education data infrastructure. This sparked a discussion among attendees about whether the College Transparency Act would fix these gaps. Another key takeaway from this presentation questioned how tools address equity, in part by providing data that is specific to different student populations. This means that tools must be able to provide data on student outcomes for underrepresented populations, such as women and students of color. This data would provide more transparency into how institutions serve underrepresented populations, and allow these populations to make more informed choices. Google, College Board, and the California Community College Online District each presented on innovative new initiatives in the space. Susie Vaks DePianto, Senior Program Manager in Engineering at Google, highlights the company’s new college search feature. Susie Vaks DePianto and Sitaram Iyer from the Google search team, presented a broadvision for an online experience that includes data-driven job search, career pathways, and college search tools that are all interconnected and meet the specific needs of each user.Google emphasized the non-linear experience of the college searcher, moving from inquiry to the next organically, and shared their commitment to an open data ecosystem. In June, Google introduced their new college search feature that uses data from both the College Scorecard and the Integrated Postsecondary Data Education System (IPEDS). By combining more in-depth information and data with simple search functionality, this tool makes it easier for users to explore college options and access important data that is essential to their decision-making. Aaron Lemon-Strauss, the Executive Director of College and Career Access at College Board, highlighted upcoming improvements to one of the most widely used tools in the college search space – their all-encompassing BigFuture tool. This tool provides information and assistance on several major factors that play into college search including finding and comparing colleges, exploring careers and majors, strategies for paying for college, information on loans and financial aid, and applying to college. Additionally, the tool provides students with a free plan that lays out deadlines and tracks their progress. College Board provided an overview of the innovations that will soon be introduced to the tool including a mobile-friendly version, more holistic college comparisons, and a chat feature to virtually connect students with college advisors. Ajita Menon, the Senior Advisor to the Chancellor of the California Community College, system showcased the institution’s plans for a fully online community college that would focus particularly on meeting the needs of working students. They are currently forming partnerships with major companies to launch the online college in 2019. This innovation further emphasizes the theme that college tools must meet students where they are. Aaron Smith, co-founder of Young Invincibles/President of YI Advisors, and Tom Allison, YI’s Deputy Policy & Research Director, lead a breakout discussion on the innovations, roadblocks, and opportunities in college search. The event wrapped up with breakout groups in which participants dived into a series of questions that sparked discussions around the college search process.These breakout sessions were a great way for each participant to have his or her own voice heard, and to provide space for a free-flowing conversation about the key barriers and opportunities in the college search landscape. This word cloud, featured below, is comprised of the key words and thoughts echoed by participants during the breakout sessions. According to participants, at the core of the problem is the lack of student access to institutional data, information, and programs that help them make informed decisions. Michaela Drust is the Communications Fellow for YI Advisors, the consulting arm of Young Invincibles. She is a senior at The George Washington University in Washington D.C.